Last chance: We only have 18 left - This product will not be available again once our stock runs out. Size (inches): 14.53" X 7.01" X 3.86"
"Three Rings for the Elven-kings under the sky, Seven for the Dwarf-lords in their halls of stone, Nine for Mortal Men doomed to die, One for the Dark Lord on his dark throne in the Land of Mordor where the shadows lie. One Ring to rule them all, One Ring to find them, One Ring to bring them all and in the darkness bind them in the Land of Mordor where the Shadows lie." This collection of 12" collector action figures spotlights some of the most important characters of the Lord of the Rings films. The fully poseable, intricately detailed figures come complete with authentic fabric costumes that flawlessly capture each character's distinctive outfit and weapons from the live action motion picture. A jovial, but eccentric Hobbit of the Shire, Bilbo was the much loved uncle of Frodo Baggins. Bilbo enjoyed a long and prosperous life after his earlier adventures with the wizard Gandalf and the Dwarves, in part due to preserving qualities of the mysterious, magic Ring he had found in his travels. After a time Gandalf became suspicious of the true nature of Bilbo's Ring, and began to grow concerned by the old Hobbit's infatuation with the trinket. I've been wanting this Lord of the Rings figure for my collection for ages. Not only is it no longer available in stores in my area, back when it was, it cost three times more than the price on zooscape! So I was able to splurge and order a couple of them from you! Shipping was prompt and the figures and their packages both arrived in excellent condition - which is important to a collector. Thank you! 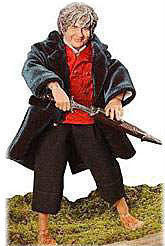 More Photographs - Bilbo - Lord of the Rings - Hero of the Hobbits - Fully Poseable - Intricate Detailing - 12"
End of More Photographs - Bilbo - Lord of the Rings - Hero of the Hobbits - Fully Poseable - Intricate Detailing - 12"